Rashes due to Henna Tattoos? I am an 18 year old girl. Whenever I put Mehendi (Henna) tattoos I get small rashes on the back of my wrist and palms. Why does it happen? Should I not use Mehndi at all? 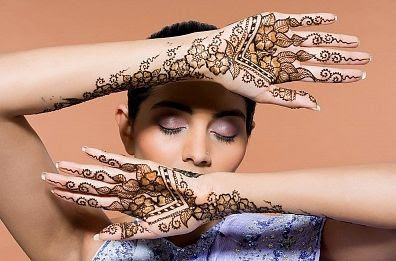 People have been using henna on their body since thousands of years in many countries across the world without any problems. Pure Mehendi powder rarely causes allergies or to put it in other words contact dermatitis with pure henna is extremely rare. In fact, henna soothes rashes and boils. So it’s surprising to know that henna body art is giving you rashes. To find out if you really have any allergy, conduct a patch test using a paste of pure henna powder with purified water (even without mixing lemon juice) on a small area of your skin and wait for 48 hours to see the result. If you get rashes, then I’m afraid that you are that rare person with an allergy to henna and you would rather do without henna either or your hands/ legs or your scalp. If all is well with your skin after 48 hours, then it‘s quite possible that you might be allergic to other ingredients such as lemon juice, tea decoction etc mixed with henna paste. To find that you could try another patch test with all those mentioned ingredients added to henna paste. Now if this gives you a rash then only use pure henna paste for making henna tattoos. Do not bother to mix anything else with henna paste. After putting mehendi when it gets dried, wash your hands with clean water. Then put one or two drops of Savlon antiseptic lotion on the hand. Do not use clove oil or warm your hands on a tava on which cloves have been placed (this is usually done to deepen the color). By doing this, and by using only pure henna powder or homegrown henna powder, there will not be any allergy. Now I have doled this advice, assuming that you have used good quality pure henna powder. It could also be possible that your henna powder is not pure and that’s why it is giving you rashes. So switch to a reputed brand or if you can manage to procure homegrown henna leaves powder, its all the more better. Also if you had used ready-made henna cones available in the market for putting henna, then that could also be a reason for your rashes and allergy. You never know what ingredients go into making of this paste in a henna cone. So it’s better to avoid usage of such ready-made cones. Instead make your own cone with freshly prepared henna paste (devoid of lemon juice or tea decoction or any essential oil if you are allergic to these) and use it and you’ll never get any rashes. Pure henna powder has that peculiar smell (if you have a plant at home, you can just crush the leaves and take the smell) and has an earthy green colour. Sometimes green food color is added to it to impart a perfect hue; this doesn’t pose much of a problem, though. However do not buy powder that is slightly brown or doesn’t have a henna-like smell. Also sometimes to disguise some old, stale powder, green color is added to it and using this doesn’t stain the skin well. So along with the color, paying attention to its smell is also important. The look, feel and smell can instinctively help you recognize the genuineness of the product. Also I would like to add that you should never get yourself tattooed from street-side tattooing salons and stalls. Usually they use Black Mehendi / Kali Mehendi. 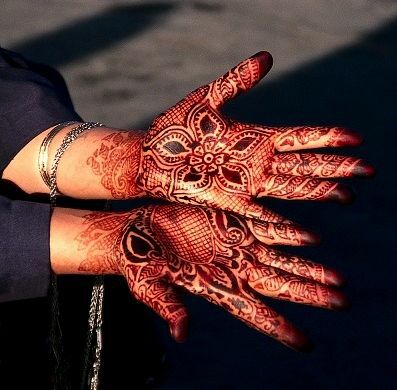 Mehendi can never be black; pure henna can only impart an orangish/reddish brown stain on your skin. It’s only because of a chemical PPD that’s added to it which stains the skin in a black ebony colour. While pure henna takes 8-12 hours to stain, this so called ‘black mehendi’ can stain well within 2 hours. Also while pure henna tattoo lasts for 2-3 days, black henna tattoos last for over a month or so. So it’s the preferred choice of street-side commercial henna tattoo artists. This particular chemical paraphenylene diamine (PPD) also extensively used in hair dyes can cause a blistering skin reaction and nasty bumps on skin. Sometimes it can even lead to permanent scarring. Even a lifelong allergy to PPD and hair dyes cannot be ruled out. Read these horror stories. Moreover even a patch test with this black henna doesn’t prove helpful as the reaction can take place as late as 2 weeks or even after a month. So it’s best to completely avoid the usage of Black Mehendi either or your body or scalp. Also read the post Henna Tattoos and Allergy. Tattoo with pure Mehendi (Henna) imparts a reddish brown or orangish stain unlike Black Mehendi that gives jet black color.